David and Nathan Zellner’s ‘Damsel’ takes its own approach to the classic western genre. The end result is a delight that doesn’t always get it right, but never needs saving. Taking their own trail through the western genre, David and Nathan Zellner approach Damsel as its own unique creature: neither the cinematic equivalent of a lawman who always adheres to convention, nor an outsider whose confidence proves overstated, nor a flailing victim who needs saving. Telling of the well-meaning but hardly heroic Samuel Alabaster (Robert Pattinson), who’s keen to marry the woman he loves, and the far-from-meek Penelope (Mia Wasikowska), said apple of his eye, it instead bears the best traits of both protagonists. It’s wily and goofy, untraditional yet still captivating; it’s also spirited and determined, resolutely refusing to be neatly pinned down. Samuel has a seemingly easy mission: locate Penelope, propose and live happily ever. There’s a considerable catch, however: she’s not exactly the eager bride, and Samuel hasn’t been forthcoming with all of the details. As his quest veers into quirkier territory, the film’s tongue-in-cheek relationship with its moniker comes into play. 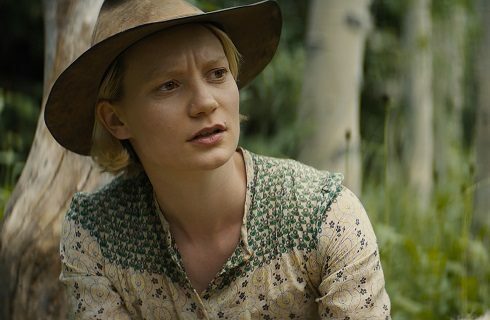 Australian actress Mia Wasikowska | © Strophic Productions Limited Damsel combines a love of the western genre in its classic form, an awareness of modern-day interpretations, and the assurance to claim its own patch of land. Playful in story and structure, it's a film of two halves that could both furnish further stories, with each interrogating recognisable archetypes with amusement, intelligence and timely insight. The Zellners, who write, direct and feature on-screen understand that every journey and every character has its own rhythms, as well. With the previous Kumiko the Treasure Hunter, maintaining the right pace was imperative in immersing viewers not only in the film's narrative but within its titular protagonist's mindset, an approach they adopt here again. Accordingly, Damsel doesn't dance to a familiar beat or sing a usual tune. For instance, when Pattinson is crooning a track called Honeybun, it showcases the movie's offbeat comedy. With each title on his post-Twilight resume more interesting than the last, Pattinson is committed to Damsel’s tone and his task, though he’s not the feature’s shining star. Explaining how Wasikowska steals the show gives too much away, but amidst the humour, homage and hefty serving of progressive thinking, she’s crucial. Admittedly, the feature she’s in sometimes takes a twist too many, though her character and the movie alike are no damsels in distress.